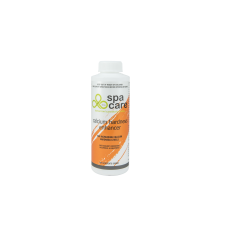 Increases the Calcium Hardness level in spa & hot tub water. Water which is low in calcium can corrode equipment, etch concrete and grouted surface, and provide an environment favourable to algal growth. The Calcium Hardness level of a spa and hot tub should always be maintained between 200 and 275 ppm for concrete and tiled spas and hot tubs, and between 175 and 225 ppm for other surfaces. Use a test kit to measure calcium hardness. Increases levles of Calcium in the water to ensure perfect water balance and crystal clear water. It is recommended you get your calcium levels checked by your local Lo-Chlor Dealer. Spa Care™ Calcium Enhancer should be added in accordance with the directions given.